Adam Ferrara is a Brazilian jiu jitsu black belt under AJ Sousa, being also one of the top representatives of the GF Team academy in the United States of America. Widely accomplished in Gi and No-Gi competition, Adam and his brother Jake (another highly accomplished grappler) are known for incorporating high level wrestling to their jiu jitsu approach, a style often defined as American jiu jitsu. Adam Ferrara was born on May 25, 1990 in Columbus, Ohio – United States of America. Ferrara started learning the grappling trade through wrestling, a sport he pursued after he graduated from school, influenced by his younger brother Jake – who at the time was already a local wrestling standout. Adam started at a local club for which he competed for a couple of years before joining a mixed martial arts (MMA) academy named ‘The Armory’ in Florida. The BJJ class there was led by big names of the sport such as Rodrigo Cavaca, Gabriel Rollo (Palito), Marcus Almeida (Buchecha), and Marlon Moraes, and soon Adam was drawn to the gi. The Armory project was short lived at this same venue where Adam and his younger brother Jake Ferrara started their jiu jitsu training. The space was then taken over by Pablo Popovitch who became a coach to the Ferrara brothers for a while, awarding each their blue belts. Unfortunately this initial academy was financially unstable and, as it crumbled, Adam and Jake switched camps joining Emyr Bussade‘s gym – American Top Team (ATT). At Emyr’s American Top Team the siblings earned their purple belts. It was also there that they met Jonatas Gurgel (Tagarela), another well respected ATT instructor who worked with countless high level competitors. Adam and Jake soon started spending more time with Tagarela, preparing for big and small events. Being highly regarded as a coach, Jonatas’ gym was often visited by many local high level black belts. This was the case of AJ Sousa, who also became a regular help to the Ferrara’s game, awarding them their brown belts in a combined effort with Tagarela. AJ Sousa’s influence grew stronger as the two brothers progressed through the brown belt category. The fact that Sousa joined the GF Team affiliation led his and Tagarela’s camps to grow slightly apart on a competitive level. The Ferrara’s then opted to become associated to AJ who guided them to important titles in their respective divisions. 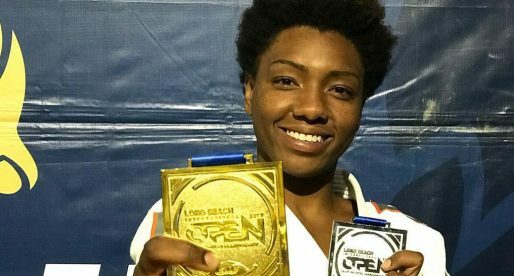 These achievements would lead to their black belts – a ceremony that took place immediately after the IBJJF World Championship, on July 1, 2017.